I used to prune in the absolute dead of winter. The trees were fully dormant and the pruning wounds would dry and heal over before spring’s sap run. But I read an article about “killing frosts” in the spring. Not that they killed the trees, but that the frost either killed the blossoms, or the trees would bloom when it was still too cold for the bees to pollinate. This is a very real issue with our new climate uncertainties. Not that all of the elements of seasons aren’t present, but that they might not occur ‘in concert.’ Over the millennia, plants and animals everywhere have developed an elegant and intricate dance, specific to region. The robins arrive just as the snow departs. The swallows of Capistrano arrive just in time for the hatching of their insect dinners. But what happens, if the storks arrive and dinner is not on the table? I saw an internet post celebrating the arrival of our first robins here, but when I look out the window, there’s still at least a foot of snow on the ground. Where will those early arrivers get their worms? Every species has its own internal clock. Some are triggered by temperature. Some are triggered by the angle of the sun. None, so far as I know, are set in motion by the Weather Channel’s debates over the American or European Model of prognostication. Here, in Leelanau, we are only beginning to learn the fancy steps to our dance–just as the local farmers and gardeners are scratching their heads about changes. According to the pruning article, one way to protect against killing frosts is to prune a little later–when still dormant, but closer to when the sap begins to run. When the tree is pruned, it takes some time for it to adjust and re-assign the hormonal signals in the branch’s ‘lead buds.’ Timed right, this will give you a slight delay in budding, thus reducing the risk of crop losses due to frost. It may also put your fruit at more risk from insects…but you have to weigh the risk of no crop or one that requires defending. I have ordered new pruning shears. Many years ago, I owned a fine set of Felco pruners, but that was a lifetime ago. In the meantime I’ve made do with a cheapie set, from the local hardware. They were hard on my hands, and hard on the trees. Though our trees are still small, our orchards are expanding. It’s time. It coincided with the loss of the crappy pruners. I’ve looked everywhere, to no avail. So I’ve ordered a replacement pair of Felco’s and as soon as they arrive, I’ll get busy with the pruning. Yesterday felt like spring, but today it’s snowing again. I’m sure that I’m still within a reasonable dormant pruning window. I have always loved pruning. It makes me a part of that intricately timed dance. Orchard trees are bred for care and do better when pruned and managed. This chore is a reminder that even when the plant world is asleep under its blanket of snow, its clock is ticking. Spring is coming. There’s work to be done. Don’t get me wrong, I don’t want to rain on anybody’s parade. But really? I have a little trouble with the whole concept of ethical consumerism. Consumerism is the problem. I cannot celebrate it by putting a positive spin on it. Sure, when you shop, buy smart. Do your research. Reuse, reduce, recycle. (And don’t forget repair!) I’ve never seen shopping as a leisure activity. I have a nice lifestyle–most of what I buy is food. My main purveyor of non-food items is craigslist. Nothing pleases me more than to find someone else’s cast-offs, repair them and give them new life. I haven’t seen it yet, but I know it’s coming. I’m bracing myself for the Earth Day Sale–or a two-fer-one, or all-you-can-eat Earth Day restaurant coupon. In the meantime, it’s Earth Day. Go outside. Pick up some litter–and make sure that you recycle it. I’m getting ready for our annual tree planting extravaganza. But today I’m doing bee events. Let’s all raise awareness of our precarious place on the planet and our individual, and singular role is setting things right. The past month or so has been a whirlwind of work and changes. First, we finally have a roof! 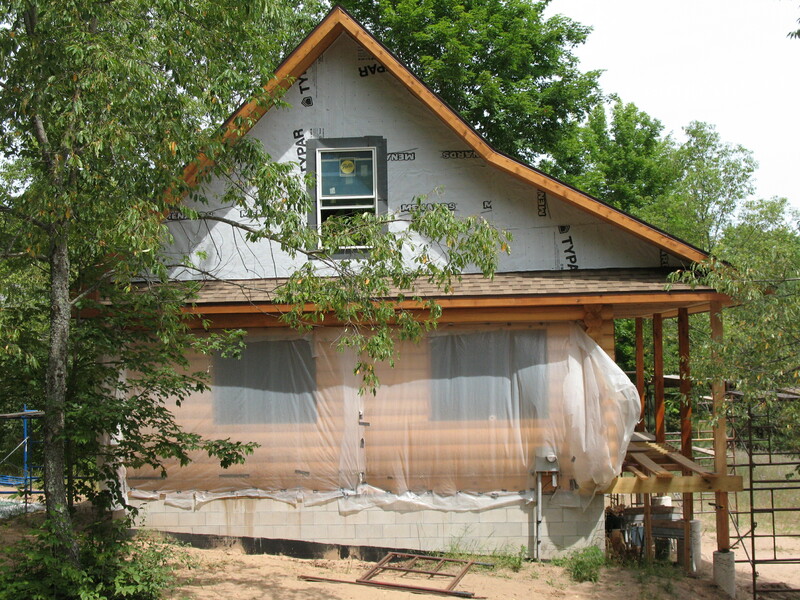 We’re working on the gable ends, and the doors and windows aren’t in, but we no longer wrestle with tarps every time the wind is up, or rain threatens. Rain was a real trial during the roof installation. After a record dry May, our crew was finally ready in June. And then the rains came. It was on again, off again, and every transition was a tarp wrangling event. It’s a steep roof, a 12/12 pitch, on the main section. We’re thankful to the Flanagin Brothers, whose daring and determination made it go up. Rick and I would have been hard-pressed to pull it off by ourselves. (We’re talking about fifty, twenty-foot long, 2”x12”s, here.) Too high, too hard, too scary. They were undaunted by the challenge. Crazy characters, they’re twin brothers whose laughter ( and, on a rare occasion, bickering like an old married couple) rings out from the work site and who, in almost eerie symmetry, work together like interlocking puzzle pieces, finishing each other’s sentences and solving problems near wordlessly–as though building were some kind of secret dance routine. It’s been a pleasure to have them around. Soon, their work will be finished and it’ll be back to Rick and I to finish. We’ll miss their levity, skills, and their cool confidence. They’d be gone already, but for a last minute idea. They were about to enclose the gable ends when one of them (I can’t remember which one) mentioned that the log to gable-wall transition could really use an “eyebrow” roof. 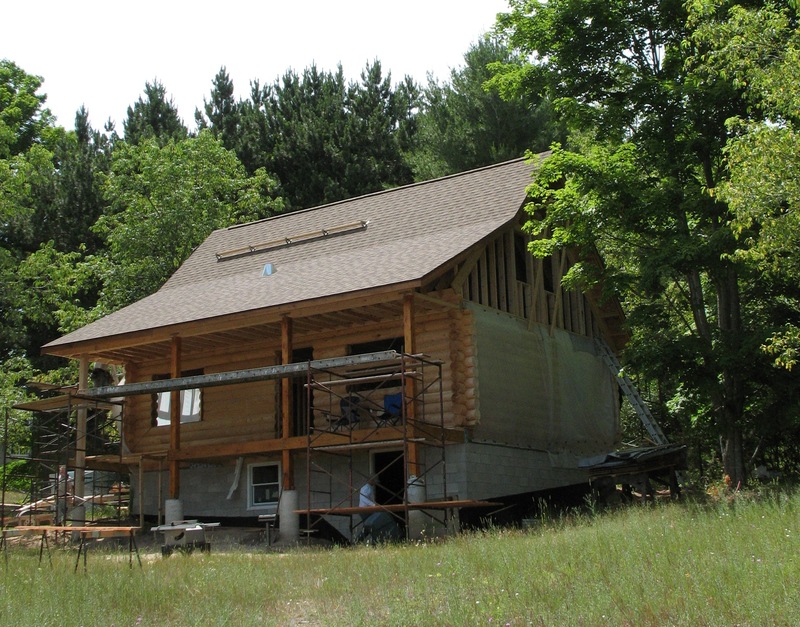 (This would be a roof line that sticks out about two feet, separating the log walls and the A-line gable-end walls.) The other twin completed the idea, “Yeah, it’d give you sun protection in the summer and keep the rain and snow off the log walls.” Rick and I looked at each other and the decision was made. Why didn’t we think of that? It’s an old-fashioned design element–a sensible way of using an extra layer of roof overhang to protect the walls and to give relief from the heat of the summer sun, while still making the most of the low-angled winter light. The Flanagins keep trying to sell it to us on aesthetic grounds–but we’re already sold on function. Besides, it doesn’t win us over to tell us it’ll have that “cute cottage look.” We’re not big fans of cute. So, the Flanagins are still with us, and we’re literally up to our eyebrows in the project. The excitement of building progress–even interrupted by rainstorms–has helped to carry me along. I’ve been under the weather, a victim of self-inflicted illness. I have food sensitivities. While I’m usually very careful, in the busyness of full-tilt construction, I misread a food label, and I’ve been paying the price for weeks. My apologies, dear readers, I have not been up to blogging–or much of anything else. It’s a good thing the bees mostly look after themselves. Had they been pets, they’d have perished from neglect. Rick has never witnessed a full-blown celiac episode, and he has a new appreciation for my normal level of kitchen vigilance. I’m mending now, and picking up the pace on those things I can do on site. I’m sealing the interior of the log walls, and just starting on the exterior. I’ve been using my downtime to source cool building materials on craigslist, recycled or reclaimed timbers that make the project distinctive, and lower its carbon footprint. It helps to us keep out of the big box stores and away from retail prices. And every offbeat purchase has a story, which gets woven into our story of building the house.